It was a dark and cold night, the streetlights projected geometric sections on the alley. I weighed my 45 Magnum in the holster and my hand felt the freedom to look for it. Then I suddenly stopped. I thought it was time to get to work…to undertake another pitch. 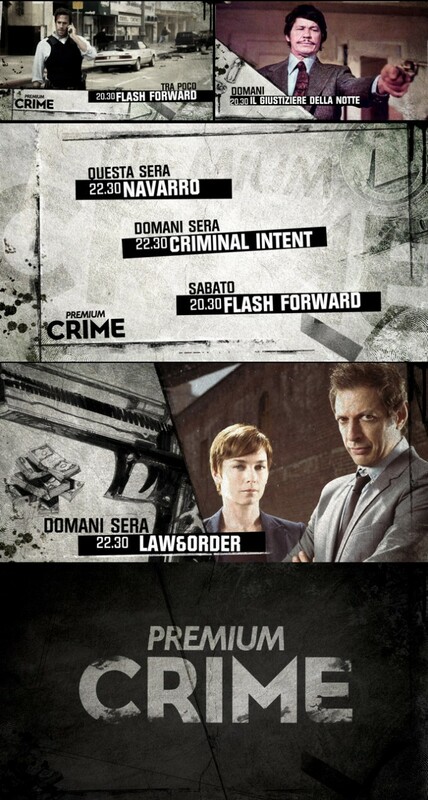 Mediaset Premium was looking for an agency able to provide creative ideas for its new noir channel launch: Premium Crime. A channel born on 1st of July 2011, part of mux Dfree together with other pay TV channels of the Premium offer. It broadcasts crime related shows and series 24 hours a day. The story of this pitch was complex and full of vicissitudes. We created several proposals completely different from each other. For the first one, we relied on world-wide acclaimed comic artist – Maurizio Rosenzweig – to create a unique and instantly recognizable brand. For the second proposal we arranged a set for a shooting on green screen, making mini-stories full of clues and chases.